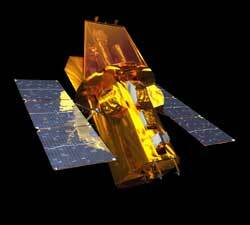 Swift, launched at 17:16 GMT on 20th November 2004, is a flexible, rapid-response satellite with a wide-field of view Gamma-Ray Burst detector and narrow field X-ray and optical telescopes. It is a NASA Medium Explorer mission, managed by the Goddard Space Flight Center and led by the Principal Investigator, Prof. Neil Gehrels; the satellite is operated by Penn State University. Besides observing large numbers of GRBs (discovering about 90 a year), Swift spends a significant fraction of its time on Guest Investigator and Target of Opportunity observations. Burst Alert Telescope triggers on GRB and calculates position to ~ 3 arcmin. Spacecraft autonomously slews to GRB position in 20-70 seconds. X-ray Telescope determines position to within ~3 arcsec. UV/Optical Telescope images field and transmits finding chart to ground. As described in the Instruments on-board Swift section, the Burst Alert Telescope is the instrument which detects elevated gamma-ray emission. The BAT has a large field of view, allowing it to detect such gamma-rays from a large portion of the sky at any one time. After this initial detection, Swift slews rapidly and autonomously, re-pointing itself to bring the detected burst into the field of view of the sensitive narrow field instruments (XRT and UVOT), which then observe the afterglow. Swift will provide spectra and multi-wavelength light-curves for the duration of the afterglow and, where possible, distance determinations. This will enable the most comprehensive study of GRBs and their host galaxies to date.